I am working with Artificial Neural Networks, on a task regarding music generation. Given: a collection of MIDI files (converted from Guitar Pro 6) where ONLY three tracks are used (per MIDI file): namely, guitar, bass, drums. For example, I converted 5 AC/DC songs from their Guitar Pro file, into 5 separate MIDI files containing only one guitar track, one bass track, and the drums track. Wanted: ONE MIDI file (with the same three tracks) that is merged from all other MIDI files. To be more clear, in the example above I mentioned having 5 MIDI files of 5 different AC/DC songs. How can I convert them into ONE MIDI file that contains all those 5 songs, played consecutively? For example, if I play this ONE MIDI file, it would produce the sound of one song until its end, then the next song, and so on until the last song. 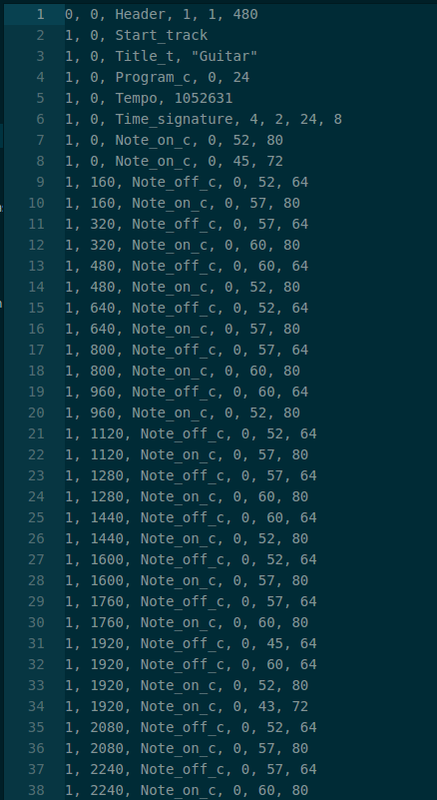 Ultimately, in order to access MIDI information in Matlab, I convert MIDI files into csv files. If it is easier to merge csv files (while making sure that songs play one after the other), then please help me with the csv merging. I found one solution myself: use a DAW, in my case, Cubase. This will allow to easily play and manipulate MIDI files. Not the answer you're looking for? Browse other questions tagged midi guitar-pro or ask your own question. How to convert Guitar Pro files to MIDI in batch?